A game without pick-ups is a game without soul. I might have damage-dealing nailed down pretty well, but what about healing? How do you recover from the pain? You pick up health packs, of course! Normal equipment is already well in place. The mechs have equipment slots, so far mirrored FiredWeapon and Shield slots on their left and right sides. You can click on an item — when you’re close enough — to pick it up, chucking off your existing equipment in the process. 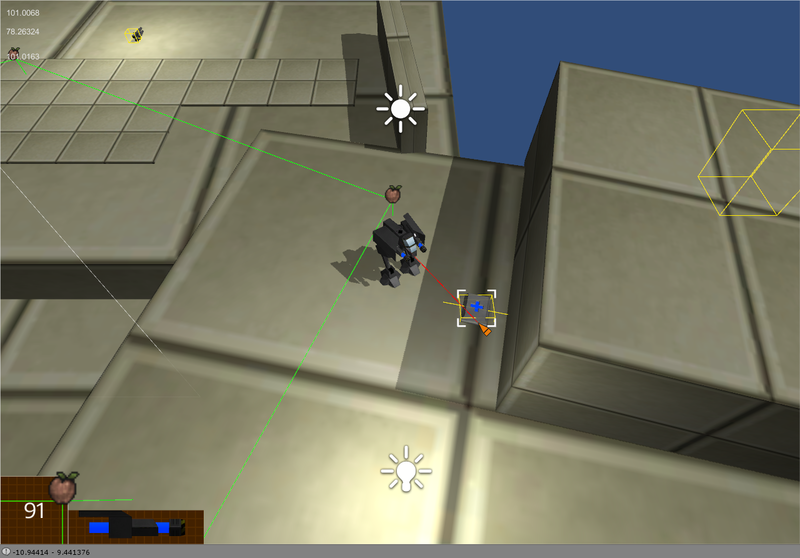 This will eventually morph into a proper inventory system; either weapons will take up 0-9 positions UT–style so you can cycle between them with the scroll wheel, or they will take up space in your Tetris screen Deus Ex-style. Maybe both, depending on the scenario. I have always leaned towards inventory-Tetris because, ultimately, I’m making some kind of action-RPG. I also like inventory management; I like the way you have to decide between carrying loot home or being prepared for a different kind of enemy, and all the other micro-considerations that go into packing your rucksack. (This is in sharp contrast to reality, where my holiday packing style is a mite less sophisticated.) So you have to be able to choose your equipment. That’s an important gameplay consideration and one of the core things in my design. Yeah, you’ll always want the cannons over the laser rifles. Instant pinpricks or knock-back explosions? No contest. Invetory Tetris is the long-term aim, though. The Minimum Viable Game path leads, naturally, through Unreal Tournament. So, you will need health. You will need ammunition. You will need armour. Importantly, you will never turn these things down — and when you’re running for your life to escape Xan with a Rocket Launcher you don’t want to have to click on that health pack at your feet to pick it up before he turns you into a thin red paste. Rinse and repeat for armour, shields and ammunition. Pick-ups are also distinct from equipment in that they are consumed immediately on acquisition. Hell, maybe ammunition will take up inventory space too one day, but you’ve got to start somewhere. Don’t just stand there, pick it up! The simplest pick-up at this point is the Health Pack… Or rather, the Repair Kit. Restore 20 precious health? You’ll never say No to that! (Well, as a pro you might, since it would be “wasted” if you haven’t lost as many as 20 hit points yet. But nobody can be a pro at my game for now.) My solution is probably awful, but hey, it works. Every frame, every unit does a sweep for pick-ups inside hoovering ranging, checks if it can acquire them, and then does so (or not). The acquisition check is so that you don’t eat up a health pack if you’re already at full, or take on more ammunition than you can hold. Items are no good unless they respawn, of course, so I had to make a spawner too — that keeps track of its item and then starts the timer once it’s been nabbed. 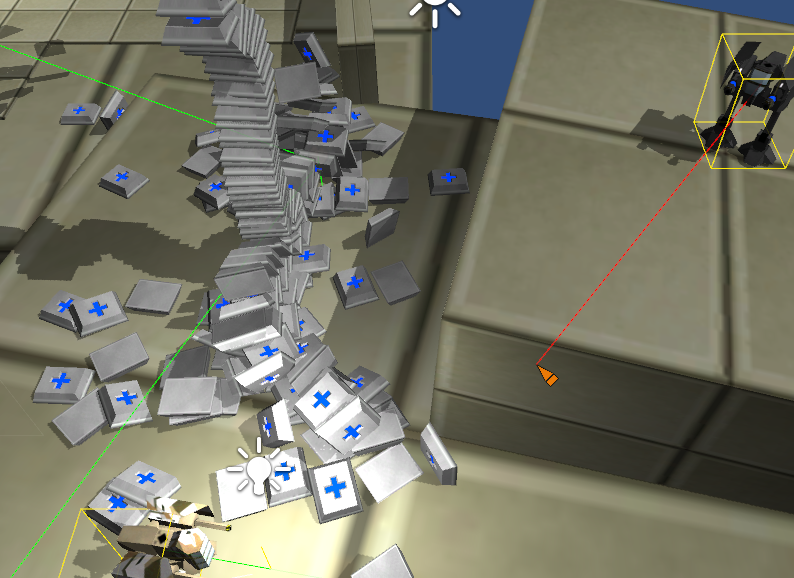 So adding health packs paves a bit of the way for more complex pick-ups, but it doesn’t take us quite there. Ammunition is going to be interesting because that needs to straddle the gulf between the unit’s inventory and its weapons, plus add a whole heap of considerations around what to do when a weapon runs dry or needs reloading. (I think reloading will benefit this game, so that you have a chance to escape the hail of bullets from more rapid-fire weapons.) Ablative armour will also be interesting because there is no damage reduction mechanism yet. This will eventually touch on the unit’s current equipment too — those blast shields will provide a measure of permanent damage reduction, with ablative armour panels picked up around the level absorbing some of any incoming damage by sacrificing itself. Just like Unreal Tournament! Until then, though, here’s to… your health. 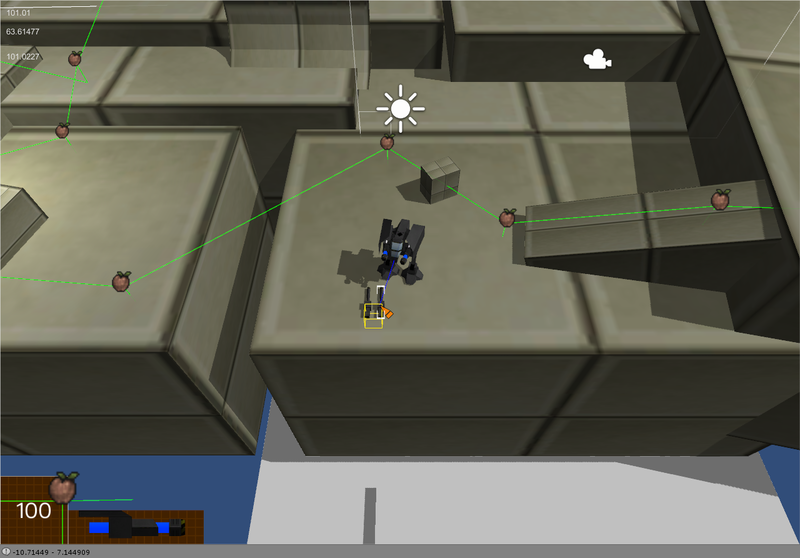 This entry was posted in Game Development and tagged health, inventory tetris, No Excuses, pickups, Unity3D by Rao Dao Zao. Bookmark the permalink. Looking better and better . Hopefully by the time you release it I’ve learned the basics to unity myself so I can mod . However I do think you should have a higher ploy version of the square texture as it looks quite ugly on the larger scales . Modding will not be possible, it is too much effort. The ground textures are completely misapplied because I haven’t built a proper level yet.